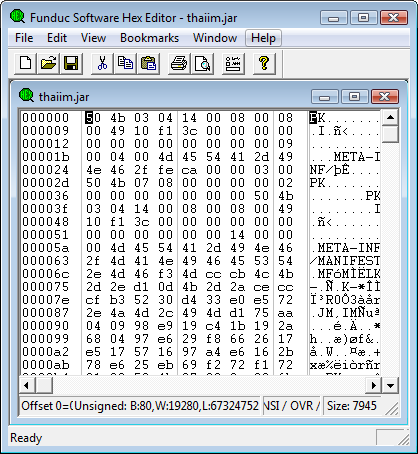 FSHED is not intended to be a full featured programmers hex editor. But if you need a lightweight editor that is free, you are welcome to use it. The program's options settings are saved in an .ini file that is created in the same path as the program .exe. This makes the program more friendly for 'portable/USB' drive use. Simply unzip the respective zip below only your drive and run directly from the drive. 'No installation required. Search and Replace & Replace Studio Users: Older versions of our programs default to using our legacy hex viewer, HexView. We encouraging users to download FSHED and change their program settings to use FSHED instead because of the additional features & functions available in FSHED. Portions of FSHED use functions in the "frhed - Free Hex Editor" by Raihan Kibria and others (Frhed). Compared to frhed, FSHED has different user interface with additions such as support for multiple documents and printing. The partial source code for FSHED is available below. You may use this freely in conjunction the frhed source available on Raihan Kibria's site. fshed_setup.exe (1.1 MB) - This installs either the 32 or 64-bit version depending on the computer operating system. See Install & Uninstall Information for guidance about installation and removal. Download this to a temporary directory and run 'fshsetup.exe' to install. fshed.zip (.93 MB) - Manual install. This zip contains the 32 & 64-bit version .exe's. Unzip this into the subdirectory of your choice. See the .txt files in the zip for more info. Source Code (100 KB) - The current file name is fshedcode-072212.zip. We will update the url aschanges are made. You can bookmark this page but please do not bookmark the link. Thanks.